The ideology of working from home has spread up across the world, which has given a new dimension of running an organization or any business at ease of the employees. According to a recent study, work from home does not only benefit employees but also increases the productivity, and also it saves money by many means and also decreases the stress level of handling all level of care in the company. Following are mentioned few advantages of home working and also have disadvantages of working from home. Being the way you wanted to be, is the biggest advantage of working from home. People working from home has an advantage of accommodating themselves a nice office setup wherever they wanted to be. It is generally said that the work efficiency increases in a good level only when an employee has a good office setup. Having an office as the way they wanted to be is always a plus. This is a very important aspect of working from home, as people generally have their own work timings according to their mood. Having own work hours will help the employee to be more productive, and more freedom to work the way they want. Lot of time is been saved from commuting from office to home and vice versa. This helps the employee not to distract from work rather than spending time on the dress they wear, facing the traffic and many inconveniences. Having a schedule on their own is a big stress buster. Sometimes a person might not feel so good or up on mood to work. Working from home will help them to have their own schedule and taking a break from regular work will help them increase the productivity. Even if they take a ten minutes break they can move easily around their house by having a cup of tea or watering their plants will make them relaxed. This is possible only if they have a schedule of work slot. Being on your own is the good part of working from home. Just because you don’t have any colleague around to help you, it will make the person be more pro active and independent in working on their own. Yes, you might have technological aspects to help, but still the person will have time to search on their own. This will help to increase your ability and enhance your skill set as you work on your own. Right from the emails, the person will be able to be more clear as he is away from his office desk. Being independent is never bad in doing your job. Technology enhancements have never let a person out of contact. Nowadays, all business has lot of tel-communicating options like emails, phone calls, video chats and lot more. This will always help the employee to get immediately in contact to solve any kind of urgent issues where presence is needed. In-fact, working from home has become more easy and convenient due to the presence of technological advancements. Being alone in your home will certainly improve the focus on work. Sometimes there might be distractions, but as the commitment increases due to the non availability in the office desk, an employee tends to be more alert and focused to the job. Actually many things can be avoided from office distractions like gossip talks, frequent breaks, unnecessary meetings etc. You cannot choose people or your boss. There might be few people who really distract and guide you away from the job. And it is very difficult to cut down the talks without any embarrassment. 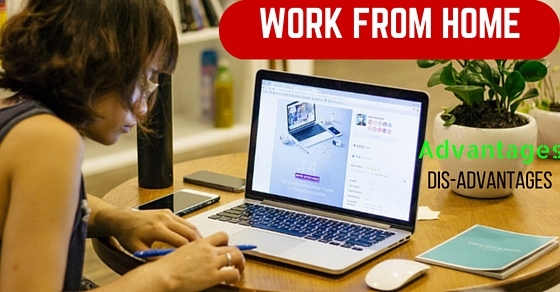 Working from home will surely help to stay focused and stick to the job role than any kind of office politics. There is nothing big in this world than responding to your family commitments. It doesn’t mean working from home can give you lot of freedom in attending your family life. But, still it helps to connect and be there when you are most needed. Good work life balance is very important to be on your toes in your job life. Certainly, work from home will help a little to be connected. It is very common in office environment to be surrounded with lots of noise and disturbances around. This will hinder the concentration and make stressed. Having a peaceful environment and fresh atmosphere is possible from working at your home. This will help to be more active and focused on your job. It is a common notion that an employee tends to be lethargic when boss is not around or when he is not at his office desk But the truth is, more commitment comes only when given a responsibility of doing things on own. Working from home has more benefits as the person takes more commitment and responsibility of doing things at his own place. One of the biggest benefits of working from home is that you can choose any software you please. There is no need to go by the rules of your office anymore. Now you can download what you like and use things whenever you feel so. Nobody is there to tell you which software should be used and what is not allowed and that we think is a wonderful benefit of working on your own. Another benefit of working alone is that you will have more time for yourself. If you have ever wanted to work alone, go ahead and do it because you won’t have to deal with too many people anymore. Neither do you have to go through things like office politics. You can save a lot of time for yourself and stay more focused and inclined towards the assignments that need to be completed. There is no need for you to worry about making it on time anymore. You can make dinner for your kids at home whenever you please without having to worry about making it on time for your kids. In fact your relationships will improve at the same time as you will be able to make more time for the kids and your spouse. This is definitely one of the best benefits of working from home. One of the best things about working from home is that you get to be your own boss. You don’t have to be reprimanded, scolded and called by one to finish an assignment. You will not be pressurized by someone as a result of it. When you become your own boss, you are able to do well at work because ultimately at the end of the day you know yourself better and you know what it will take you to get to the top of your business. There might be some kind of risk in sharing or transferring information away from office. So working from home might lead to information security risks at times. Sometimes this might be the reason to deny work from home options to the employers. Sometimes long duration teleconferencing calls, normal meetings or status updates through phone calls can cost more than usual. So, sometimes this might hinder giving a work from home option. Missed telephone calls or less data connectivity can cause some technical delays when working from home. There might be some difficulties due to communication problems while working from home. Good rapport is always needed to have a healthy environment in office. When employees often take work from home, there are lot many chances to not communicate with each other and sometimes it might create a distance from each other. There are chances of decrease in staff coordination. There are few jobs which might not suit working from home. There are jobs where individual presence is very much needed. Hence, work from home is not a good option. There are chances of being avoided or overlooked for a promotion as your presence might be missing in office. This might also lead to not being involved in higher level decisions. Getting only to job mood, might be difficult many the times in home. Maintaining a discipline depends and varies from person to person. Due to this reason work from home might be a disadvantage. Working from home might also lead to miss few major occasions in office. A person might tend to miss the day to day activities like newsletters, birthday events, inauguration of new technologies and many more. Due to this reason work from home is not as good as the regular office. You will face plenty of distractions when you are working alone. The thing about working from home is that a lot will be placed in front of you because you are at home all the time. You might have to get off an important phone to call to attend your kids or do the laundry or something urgent that comes at home. Finishing all your chores is needed but you must remember to keep away from all kinds of distractions if you want to become the best. Another sad part about working at home is that you don’t stay active all the time as a result of which you become very lazy person. That actually happens to a lot of people who work at home. Not only do they become all lethargic but also end up putting on weight. If working at home for you is a compulsion, we would suggest you to spend at least one hour on exercise every day and be careful of what you eat otherwise you could end up putting on a lot of weight. One of the worst things from working at home is that there is nobody to help you. You will have to work and help yourself the whole time. There will be nobody to reach out to you or be your staff. You have to handle all work and assignments on your own. In that way you have to make sure you have done that well. So How Can you Stay Productive? In order to stay productive all the time, you must learn to prepare your environment. By this we mean you have to get rid of all distractions and make sure you know what the day demands from you. You should keep enough pens, papers, coffee and printers so that you can keep away from distractions while working so that there is no distraction whatsoever. It will help you do so much better. Working from home has both advantages as well as disadvantages equally. It depends upon the person majorly to handle their professional life in a very good manner. It is in the employee’s hand to choose the right thing for him as well the organization depending upon the pros and cons. If you have liked this reading post and do related to some of it, do let us know more about it in the comment box below. We would love to hear from you. On that note, good luck and happy working.